Enough materials for 15 students working in groups of three. 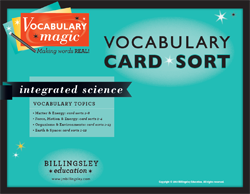 Each Card Sorts consists of 27 cards: 9 vocabulary terms, 9 full color images, and 9 student-friendly descriptions/definitions. Cards are printed on heavy-duty 14 pt. paper with gloss UV coating for durability. Cards have full color, high-resolution images for each of the 333 terms. Cards include student-friendly descriptions/definitions for easy reading and comprehension. 37 card sort PowerPoint presentations. These can be used for review, lecture, and classroom discussions. Student Instruction Page for using Card Sorts and Vocabulary Trailers. Pack & Storage System: 200 (4x5) zip-lock storage bags and 37 (9x12) zip-lock storage bags. 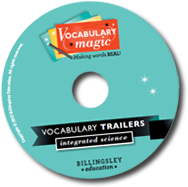 Research and trouble-shooting tips that teachers need when using Vocabulary Magic Card Sorts and Vocabulary Trailers. Guidelines for creating your own Card Sorts and Vocabulary Trailers. Tips and strategies for working with English Language Learners or for students reading below grade level. Games and extension activities for students to use to increase understanding and comprehension.